The human brain runs through about 60,000 thoughts a day, many of them are repetitive. Out of all of those thoughts, 86% of them are negative. With that in mind, the developing brain of a minor is ever-changing and may reach a few bumps in the road that could lead to fear and negativity. A local grass roots organization is working to beat those odds by channeling thoughts of positivity and self-affirmation in today's youth. When you think of a mentoring program, you might think of a group of awesome people who come together to guide the youth. 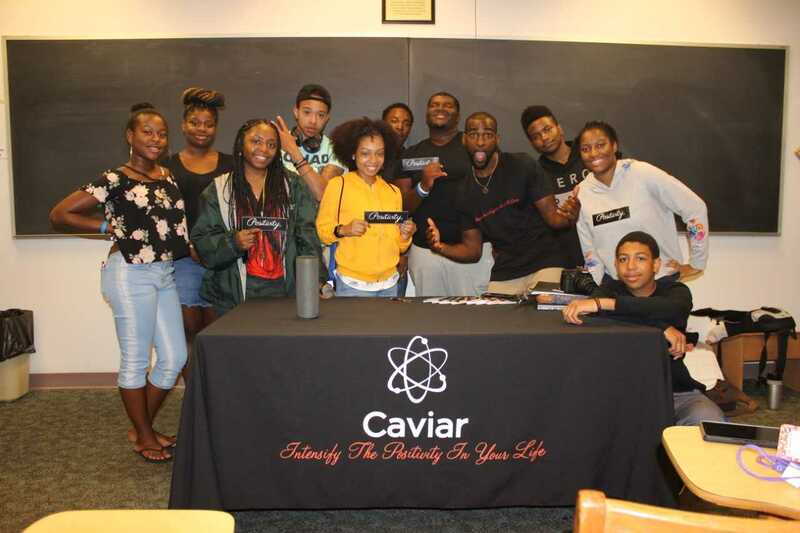 But organizations such as Positively Caviar have changed the game of mentorship and are teaching the youth to overcome fears, live their best lives, and reach their fullest potential while channeling positivity in the conscious and subconscious mind. "It's really about the science of optimism and positivity to instill mental resiliency through life's trials and tribulations," said Chazz Scott, Founder and CEO of Positively Caviar. It’s no easy task convincing a room full of kids that they can erase doubt, fear, and ultimately create a world of positivity by just simply thinking it. That's why the organization has built a small team of positive influencers/mentors, called "The Nucleus Team," to touch the lives of its audience through its B.U.I.L.D. workshops, motivational speeches, and positive social media posts. While on their quest to spread positivity to the youth, they held a seminar at McDaniel College. One of the youths in the audience was Adonis. Today, he calls himself an aspiring singer, but before the seminar, he was too shy to utter or write down his big dreams around others because of the amount of doubt he felt. Then founder Chazz asked the audience these life-changing questions: "Who can you go to that you trust?" "What do you want to be?" "Raise your hand if you're happy." After that workshop, Adonis knew that he had left the seminar stronger than ever before. "He was so impacted, and his mom came up to me crying because she says she has never seen her son so awakened," said Scott. “It just reassured me that I am on the right path and that I am doing the right thing and I love it," said Adonis,"I've been telling people about it because I feel like this is a movement that everybody should get around." It's a movement that has driven the youth to know that their thoughts control their minds and ultimately their futures. “It’s so important that we’re leading the youth, I feel like, you know, there is a lot of millennials and there's people that want to get active in our organization so we can make sure that they volunteer, but at the same time they can be mentors to the young children that they are teaching,” said Scott. It's a chain reaction that can one day universally spread positive atoms through the minds of one person to the next. "People don't want to be around people that are negative, people want to be around people who are positive." -Chazz Scott, Founder and CEO of Positively Caviar. For more information on this organization visit their website at www.staybasedandpositive.com or email the team at info@staybasedandpositive.com.